William who is from Castlethird, Carrigans, Lifford in Co. Donegal won this award for a safety poster he designed after hearing a presentation from Arthur Byrne Public Safety Manager with ESB Networks on the risks on Irish farms of an electrical accident. He was congratulated on the ESB stand by Marguerite Sayers, Managing Director, ESB Networks and Sean Finan, Macra National President. 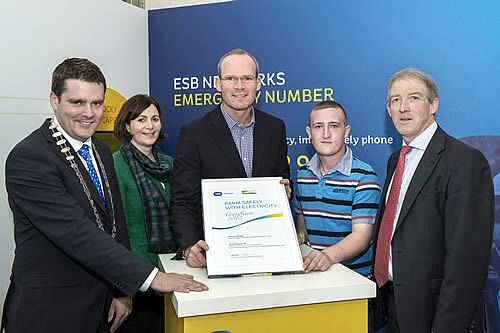 ESB Networks have an excellent record in reducing electrical accidents on farm and over the last two years no fatalities have occurred on Irish farms. The successful ESB communications strategy has included the raising awareness of the danger of tall machinery working too close to overhead powerlines and the use of RCD’s (these cost only around €15) to prevent electrocution by faulty portable electrical equipment such as power washers. Other VIP’s attending the presentation included Brian Rohan founder of Embrace Farm, Pat Griffin, Senior Inspector with the Health & Safety Authority, John McNamara Health & Safety Officer with Teagasc, Larry O’Loughlin, Regional Manager with Teagasc, John Kelly, Principal of the Teagasc Agricultural College in Ballyhaise plus Tom Ryan, the Teagasc Machinery Specialist. More VIP’s included Charles Gallagher, Chief Executive of the Irish Holstein Friesian Association, Gerry Mooney, Health & Safety Manager with ESB Networks, Maura Canning, Chairperson of the IFA Farm Family & Social Affairs committee and Peter Gohery a Galway farmer and a well-known farm accident victim.